New mathematical data drawn from radiocarbon dating of human remains has been used to create the first fully scientific estimate of the creation of Egypt. The new research, including work by Dr Linus Girdland Flink, a research assistant at the Natural History Museum, involved collecting dates from hair, bone and plant samples excavated at key archaeological sites in Egypt. The remains housed at the Museum, excavated from the First Dynasty royal tombs of Abydos, Egypt, come from the burials of courtiers. They were probably sacrificed to accompany their king to the afterlife. The practice appears to be unique to this period. Radiocarbon dating assesses rates of decay to estimate age. Despite their age, the remains are in a remarkable condition. Until now, research has relied on archaeological evidence alone, using the evolving styles of ceramics found at human burial sites to piece together a chronology of events. In order to rewrite Egyptian history, scientists from the Research Laboratory for Archaeology at the University of Oxford took the original information and added in the new radiocarbon dates. This specific information then allowed them to come up with a more reliable timeline for when each of the first eight kings and queens ruled over the Egyptian state between 4500 and 2800 BC. The accession of King Aha to the throne is considered the beginning of a united Egyptian state under one ruler. The new research suggests (with 68 percent probability) that he became king between 3111 BC and 3045 BC. Much of this original work was done by Sir Flinders Petrie, a British Egyptologist who excavated most of the important archaeological sites in Egypt in the 1890s. He used strips of cardboard to catalogue pottery found at the digs. 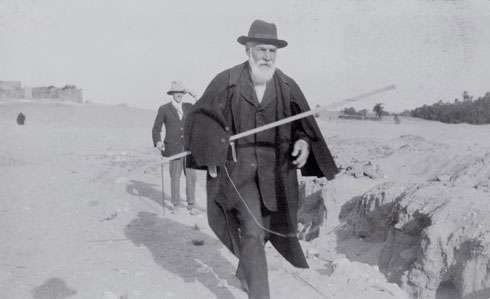 Petrie presented many of the human remains he excavated at these sites to the Museum in the late nineteenth and early twentieth centuries. Abydos is a key archaeological site for understanding the prehistory of Egypt as most of its early rulers are buried there. The site later became the centre of the cult of the god Osiris. Egypt was the first territorial state to be brought under one political ruler, a millennium before the pyramids were built. Results of the study are important because they suggest that this unification happened much more rapidly than previously thought. Dr Alice Stevenson, co-author of the study and curator of the Petrie Museum, University College London said the period witnessed profound changes in social, political and economic conditions that resulted in the creation of the ancient Egyptian state. 'The results of the project give archaeologists an invaluable framework for visualising this sequence of change and understanding the pace of these cultural changes', Dr Stevenson said. More information: See a video CT scan of a mummified Egyptian cat.